Toyota just unveiled two brand new small minivans, apparently due to popular demand. Called the Porte and the Spade, they both have two sliding doors to allow ease of entry in narrow Japanese parking decks. While the idea is similar to the super uncool and unpopular Peugeot 1007, the name of one version is an even bigger problem. 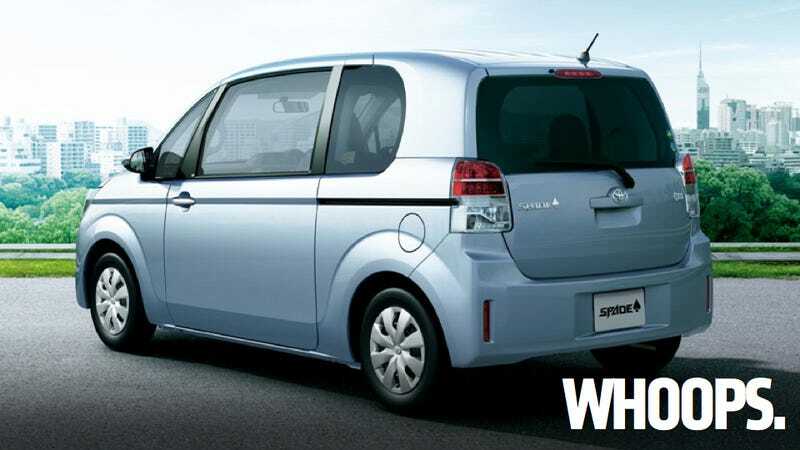 First off, even though they have different names, the Porte and Spade are actually the same car and will be sold through different parts of Toyota's confusing Japanese dealership structure. Secondly, the names aren't the best choices. Porte is French for "door" while Spade is a bit more problematic. While Toyota claims the name was derived from the words "space" and "wide," Spade is also a racial epithet that was used against African Americans in the latter half of the 19th and early 20th century. Yeah, that might not be the best choice.